I have really fond memories of this movie, and I was convinced I'd regret watching it again. I'm happy to report that not only does the movie hold up, it's actually a bit better than I remembered. This one really deserves its status as one the best Christmas movies out there. I appreciate that a spoiler warning is fairly absurd for a movie that came out in 1947 and that almost everyone's seen a dozen times on TV, but... I want to be sure for this one. If, for whatever reason, you've never seen this, stop reading now and go see it. Find it on TV, put it on your Netflix queue, or buy it on Amazon. You can buy the digital download for four bucks . Do what you have to, but make sure you see it. What really impresses me is that this is a fantasy without the supernatural. There's ostensibly nothing magical that occurs in the movie, and yet it's magic to the core. The movie never confirms that Kris is the real deal. Sure, he found a house for sale matching the one in the picture, and he obviously left his cane for them to find, but that doesn't mean he's thousands of years old or has a team of flying reindeer. They could have done this. They could have forced in a shot of him in a sleigh or done something similar. And it would still have been a good movie. But it wouldn't have been brilliant. 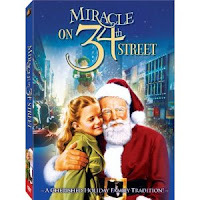 The genius of Miracle on 34th Street is that they don't tell you Kris is Santa. They convince you. By the end of the movie, there's no question in the viewer's mind, despite the fact there's no proof. And that's kind of the point. I also love that Kris arranges for people to get the gifts they want. He directs parents to where they can find what they're looking for. Hell, he even makes sure to promise the son of the DA prosecuting him a football helmet while his father's listening, ensuring that the kid will get his helmet one way or another. I don't think there's any question this is the best interpretation of Santa Claus ever put on film. If you haven't seen this in a while, do yourself a favor and track a copy down. Thing is, the football helmet was a subplot. The DA couldn't find one, but then there it was under the tree X-Mas morning, and neither his mom nor dad had gotten it. I've seen that scene referenced a lot but I can't find what happened to it anywhere!